A quick check of the national political environment is encouraging. One-third of voters self-identify as independents , and Congress’ job approval sits in the low double digits. Voters are unhappy with the status quo and the two parties’ political establishments. Running as a moderate (or centrist, if you prefer), Bloomberg would have little or no chance of carrying the most ideological states and the most partisan ones. Not surprisingly, the two groups overlap, according to a recent Gallup analysis of state partisanship and ideology . Using the Gallup categories as a guide, I count 29 states (plus D.C.) with 243 electoral votes as starting out of Bloomberg&apos;s reach. That leaves 21 states, with 295 electoral votes, as potentially winnable (assuming that Bloomberg makes it on all state ballots). 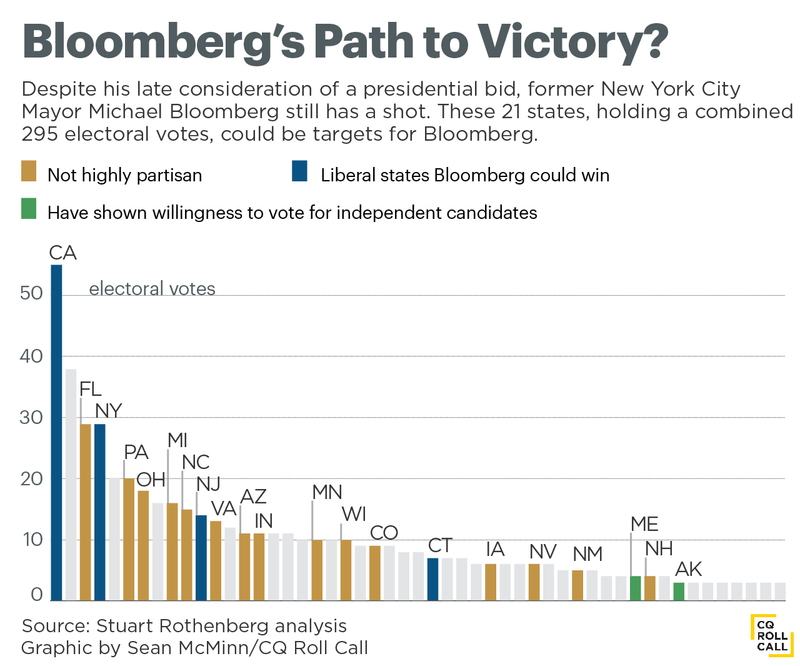 Part of Bloomberg’s problem is that his appeal is not equal to disenchanted members of each party. His progressive positioning on cultural matters and New York City&apos;s reputation represent a far greater impediment to him winning Republican voters than is his pragmatism on economic issues to attracting Democrats. Trying to Make Sense of the Post-New Hampshire Republican Race Can Rubio Follow Romney’s Path to the Nomination? What the Hell Happened to Jeb Bush?